With the polar vortex wreaking havoc in the midwest and almost everyone we know coughing and hacking and sneezing and feeling yucky, we figured it was a good time to follow up on Tuesday’s blog (Let Food Be Thy Medicine and Medicine Thy Food). Our daughter, Sara, the food writer/foodie/Tacolicious co-owner, sent me a recipe she was making to get her family healthy-ish again. I read it while I was sipping my Lemon Ginger Tea, soothing a scratchy throat. A little Google-ing resulted in more recipes from one of my favorite food blogs: The Woks of Life (what a great name!). And I thought about the conversation with our friend Lynne who is is a bone-broth believer. So whether you’re wanting soup because it’s damn cold outside or because you’re feelin’ puny, here are some suggestions. Sara recommends this West Lake Beef Soup; if you have time, making your own beef broth is well worth the effort. Here’s a fabulous video from PBS – with lovely music to accompany it – that makes the whole broth-making process seem do-able, even enjoyable. The only change I would make is that I would simmer it during the day, instead of all night. Having the stove on at night, while we’re sleeping, is not something I’m comfortable with. Or use your slow-cooker. I’ve included my adapted version of this recipe below. There is not a great substitute for homemade beef broth but Better Than Bouillon Beef Base is often recommended. If you have a Chinese or Thai or Vietnamese market anywhere near you, go there! If you’re used to just shopping at Safeway or whatever, you’ll be inspired, enlightened – and possibly a little overwhelmed. Andy blogged about our Baton Rouge/Vietnamese shopping experiences a while back. Today we’re off to Santa Rosa try to find the herbs recommended for Chinese broths – ching bo leung soup mix. If we can’t find them, Amazon (of course) offers this package. The herbs could be used in pork or chicken or beef broth. “Traditional Chinese Soups to Warm your Soul” is the Woks of Life site I recommend, if you’re searching for a warming and healthy soup recipe. I’m planning on making the pork bone soup – Ching Po Leung. 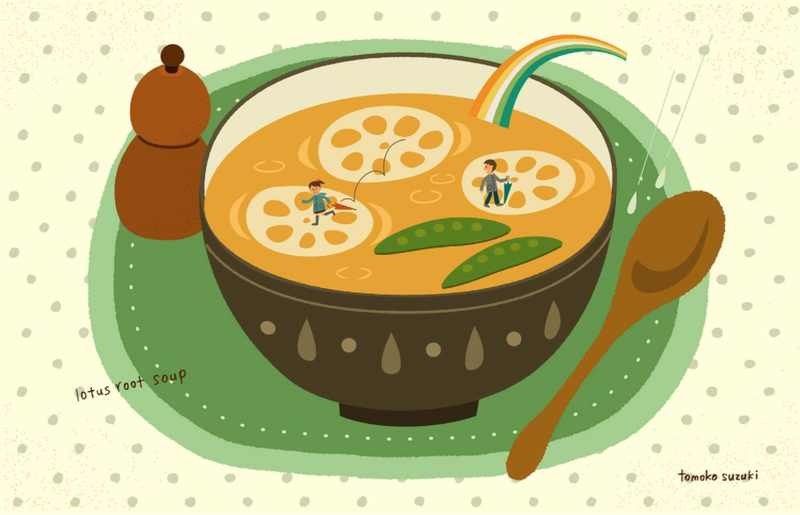 We blogged about lotus soup some time ago. So here’s to your good health. Let food be your medicine….at least up to a point. This is great for cold symptoms. Put the ginger, honey, lemon juice, cayenne, and turmeric into a teapot or pan and add the boiling water. Cover and let steep for about 10 minutes. Strain out the ginger, add the bourbon, if you’re using it, and serve. Though I prefer the recipe below, many beef bone broth recipes will suggest you roast the bones before beginning the boiling process. If you want to try that, use a baking pan lined with foil, place the bones on it and stick them in a 425 degree oven for about 30-40 minutes and then skip the soaking-and 10 minute boil-and drain steps. Just take the roasted bones, add water to barely cover, add the onion, ginger, peppercorns, and vinegar, bring to a boil, and simmer. Recipe adapted from Patricia Wong on PBS. Cover the bones with cold water and soak for 20 minutes. Drain. Add to a pot of boiling water (there should be enough water to cover all the bones) and boil for 10 minutes, then drain and rinse under cold water. Return the bones to the pot, add the onion, ginger, peppercorns, and vinegar and enough cold water to just cover the bones. Return to a boil, then lower the heat to a simmer, cover, and cook for at least 6 hours – and up to 8 hours. You might only partially cover the broth for the last several hours so that the broth reduces a bit. Strain and serve.